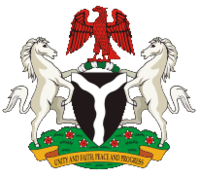 Coat of Arms: Nigeria's coat of arms features two white horses supporting a black shield. The 'Y' shape in the middle of the shield is representative of the Benue and Niger Rivers, while the color black is a symbol of the fertile soil. Above the shield a red eagle represents strength, and the national motto is displayed on a ribbon below.